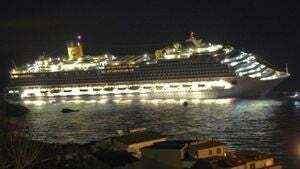 The 984-foot-long cruise ship Costa Concordia ran aground on the island of Giglio, Italy, killing at least three people. More than 4,000 people have been evacuated, but 50 are still missing. The night photos remind me of the sinking Titanic. The accident didn't involve an iceberg, but it sounds pretty similar: passengers heard a loud crash sound during dinner. At first, the captain told them that the ship had an electrical problem but the evacuation started almost immediately after that, as they were ordered to put on their life jackets and walk to their emergency rafts. The situation worsened quickly. Officials said the evacuation became extremely difficult as the ship sunk and the inclination increased dramatically. According to Giuseppe Linardi—prefect of the city of Grosseto, in the Tuscany region—many panicking passengers jumped into the sea as the Costa Concordia started to quickly lean to the side. About 150 of those have already been rescued. Talking to local media, a passenger described the scene: "it was a nightmare, if felt like the Titanic, we thought we were going to die [...] people shouting and kids crying in the middle of the most absolute darkness." One of the passengers was journalist Mara Parmegiani, who also described the situation referring to the Titanic. She said that some of the life jackets and the emergency lights weren't working. In addition to that, "there were problems deploying some of the evacuation boats, to the point in which [her] boat's pilot had to be substituted." Apparently, the crew wasn't completely prepared to take care of the situation. Some passengers said the evacuation was really slow, taking an hour and a half between the impact and the time they left the ship. They pointed out that some of the crew members told them that the captain knew the situation was grave, but he didn't act accordingly. 4,179 people have been accounted, 14 of them injured. There were a total of 4,229 registered passengers and crew members in the ship, which was cruising through the Mediterranean. According to the manufacturer, the Costa Concordia can hold 3,780 passengers and 1,100 crew members. The city prefect says they are searching frantically for the missing people. Ennio Aquilino, chief of firefighting services of the city of Grosetto, says that the hull is breached on both sides. The ship owners, the Italian company Costa Crociere, says they don't know yet what was the cause of the accident. The arrested captain and his sinking ship. A dramatic shot at night, just as the ship started to sink. A closer shot at night. A view of the ship from the island of Giglio. The island of Giglio, Italy, where the ship ran aground.